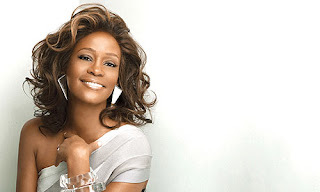 You don’t have to be a fan of Whitney Houston to recognise the impact she has made across the entertainment industry. Many of her critics would hold her responsible for influencing the likes of Christina Aguilera, or for single-handedly keeping the TV talent show alive with her catchy dance pop stuff and those timeless ballad things. I’m not a music buff. But this is an artist who has sold 170 million albums, has 11 US number one hits, 6 Grammy Awards, and the best selling single by a female artist of all time (data from BBC News), which makes her almost as big as Robson & Jerome, and for that she will always be remembered as one of the greats. The 48 year old singer of I Will Always Love You was pronounced dead in her Beverley Hilton Hotel room at approximately 3.30pm (11.30pm GMT) on Saturday. She was in Los Angeles for this evening’s Grammy Awards, and was due to attend a star-studded party last night hosted by record industry bigwig and long time mentor Clive Davis. The awards are usually the biggest event in the music calendar, but tonight it will take an appropriately sombre tone as former colleagues and friends pay their respects to someone who influenced almost everyone in popular music today. And if Michael Jackson’s death in 2009 is anything to go by, Houston’s fans will be turning the charts into a celebration of her greatest hits. Plus, we can expect Simon Cowell to deliver a touching dedication to the singer on the next series of The X Factor, for which the ratings boost will be purely coincidental and not a heartless calculation in any way whatsoever. In recent years Whitney Houston has made headlines for very different reasons. Her turbulent marriage to Bobby Brown and her long term substance abuse overshadowed her music, and her attempts at a big comeback a few years ago faced setbacks following a disappointing live tour. This will be covered in grisly detail over the following weeks as investigative journalists tell us everything we already knew and call it The Secret Life of Whitney, The Real Whitney Houston, and so on. But for the real fans of Whitney Houston, the ones she sang for, the ones who bought her records and sat through her movies out of nothing more than blind loyalty (because sitting through The Bodyguard is no mean feat) she will be immortalised as one of the most talented, most influential, and most successful performers of the twentieth century. Liam, great post. As an American who grew up listening to Whitney Houston and worked on three projects she was attached too, I don't think anyone has written what you have, in a manner that brings the finality of her death to me. I didn't tear up last night and yet, I find myself shedding several tears after reading your remarks. Whatever her transgressions were in life, all I know is that very few have affected and effected as many people as she did with the gift of song. May she rest in peace.